The Plastic Diaries: Degradable Bin Bags? The biodegradability of biodegradable-classed plastics is a subject that I have a multitude of questions about. ‘100% degradable’ plastic products shout – but so often it turns out that this is not exactly true. For starters, they will often only degrade under very specific conditions and, secondly, ‘100%’ seems to be a description that is open to interpretation. 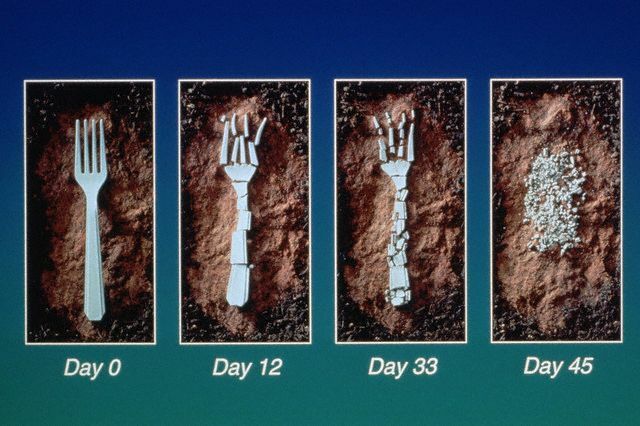 Take this photo (courtesy of Corbis), which shows how a biodegradable plastic fork disintegrates over a period of months. Cool huh? Ironically, though, the caption for the image on Corbis’ website reads ‘….. completely degrades’. Errr… Sorry to burst the photographer’s bubble, but there’s still quite a bit of visible material left in the final picture there, so I’m thinking it hasn’t ‘completely degraded’ at all. Maybe it’s no longer recognisable as a fork, but its basic materials are still pretty much in existence. As far as I can tell, there are lots of different approaches that manufacturers of purportedly degradable plastics can take – some of them, I believe, are genuine; some not so. It’s certainly a minefield, and one that I’m still trying to find a safe path through, so I won’t go into a lot of detail here today. But, there are bio plastics that are completely composed of natural materials (rather than oil-based, though oil is, technically, a natural material). And then there are plastics that are made up of a web of traditional plastic molecules which are held together by degradable materials – the strands holding them together degrade, leaving lots of teeny tiny pieces of non-degradable plastic still floating around in the environment. The difficulty for us as consumers is figuring out which are really degradable, and which are pseudo-degradable. Which brings me to the initial point of this particular post: degradable bin bags. To be honest, degradable bin bags are a bit of a misnomer. This is because in order for fully biological bioplastics to degrade properly, they really need some good composting conditions: carbon, nitrogen, oxygen, heat and water. Without these, nothing will degrade – think of the permafrost men, frozen forever in virtually their original state. And in your average landfill, where most of our household bin bags wind up, these conditions are severely lacking. So even if you’re good and green and buy those special degradable bin bags, chances are they’ll never have the opportunity to degrade. Unfortunately, Bron and I have yet to reduce our waste to a zero point – we’re not too bad, all told, but we still have our weekly deposit on the lawn for the bin men to collect, mostly thanks to the cat who, even in the summer weather, still steadfastly uses her litter tray. So when it came to deciding whether to use degradable bin bags or not, I really wasn’t sure whether there much point to it or not. Bron thought “no”, but I figured at least it’s slightly better than a completely non-degradable one. Off to Archie Browns I went, one of my local health stores, where they sell bags produced by Symphony Environmental. ‘The degradation process is initiated at the time the polyethylene or polypropylene is extruded by the inclusion of a small amount of a special additive.’ So they still contain traditional polymers then? They’re not made from corn starch, or a similar alternative. But wait, this is a good thing, they say, because it means the bags do ‘not need a biologically active environment to start degrading - this will happen even if the plastic is left in the open air! … For this reason in particular, d2w™ 'totally degradable' plastic is superior to 'bio-degradable' which requires the plastic to be in a biologically active environment (for example, by being buried in the ground) before the degradation process is initiated.’ Which gets us over the compostable-plastic-doesn’t-compost-in-the-landfill issue I suppose. I’m really not sure what to think at this point. Is this stuff good or bad? Apparently the additive used speeds up the natural degradation of plastic that would otherwise take tens or hundreds of years, so that the bags quite quickly break down into flake-sized pieces. At this point, because the polymer chains have been reduced in length, oxygen is able to bond with the carbon in the chain, forming CO2. Is this just theory or does it actually happen in the environment? The next bit I don’t quite understand – the formation of CO2 further reduces the flakes in size which makes them ‘water wettable’. Water wettable? What does that mean? Despite my science degree, my biology and chemistry knowledge, I have never heard this term before. Apparently being water wettable means that micro-organisms can access the chemicals in the polymer chains. Am I any the wiser? I still don’t know. It all sounds quite reasonable, yet I can’t help having my suspicions. Or am I just being negative? After everything I’ve read about how difficult it is for polymers to break down, this just sounds a bit too easy. I believe that the bags will break down into flakes, but I wonder how persistent those flakes ultimately are in the environment? Even if the bags don’t need composting conditions to get to this stage, thanks to the D2W additive, if the flakes then need micro-organisms to further degrade them, that does imply a composting situation – which, I mentioned earlier, won’t be found in a typical landfill situation. Perhaps these bags aren’t the ultimate solution, but are they better than the standard bin bag? Is this ‘100% degrading’? What about the microscopic bits of plastic that wind up in the environment waiting for some happy micro-organism to munch on? When exposed to wider ecosystems, these are arguably more damaging to wildlife than more solid forms of the material are, as Professor Richard Thompson can attest. I am yet to be convinced by the eco-credentials of this particular brand of degradable plastic. It is because normal polymers are so hard to break down in nature, that d2w was invented. When a d2w bag has reached the fragmentation stage (sub 5,000 Daltons) it is no longer a plastic, but a material with a completely different molecular structure which is hydrophilic (ie water-wettable) and can be bioassimilated by micro-organisms normally present in the open environment in the same way as a leaf. It does not need to be composted.